As CEO of Gyrobike, makers of a Dartmouth-originated technology, Daniella Reichstetter T’07 is taking her passion for cycling to the next level. Like most people, Daniella Reichstetter T’07 has firsthand knowledge of the pain associated with learning to ride a bike. 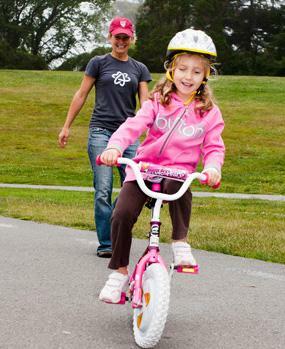 The training wheels come off, a parent extends a steadying hand, and the child starts to pedal. Then the parent lets go and a balancing act ensues, with predictable—and bruising—results. “Learning to ride a bike is one of the most challenging things a kid learns,” says Reichstetter. But as CEO of Gyrobike, makers of a Dartmouth-originated technology that takes at least some of the discomfort out of this childhood rite of passage, Reichstetter says it doesn’t have to be this way. “This was about building a product and business from scratch and for me, that was awesome,” says Reichstetter. What’s next for Gyrobike? “We need to increase distribution and lower costs to reach a wider base,” she says. The company is currently selling online and is expanding its presence in bike shops and toy stores across the United States, with plans to enter international markets in the next six months. And while a standalone Gyrowheel is the only product currently available to consumers, Reichstetter says Gyrobike is already working on a full-bike model as well as a product line for adults for the future. And why not? They’ve already reinvented the wheel.